What are the prospects for European Union accession in Bosnia, a country with a legacy of ethnic conflict and malfunctioning democracy? How might the accession of Croatia to the European Union affect this process? This paper analyses the current state of Bosnian politics through the lens of EU accession and considers the political and economic impact of Croatian accession. A lack of incentive for Bosnian politicians to implement the governmental changes needed for Europeanization—the process of adopting European rules—has created a stagnant and intransigent political climate, one made more difficult by the Bosnian bureaucracy. Ethnic divisions hard-wired into the Bosnian political system by Article IV of the Dayton Agreement make the political costs of Europeanization and institutional reform much higher than those associated with the continuation of ethnicitybased parliamentary politics. However, Croatian accession (and the associated process of leaving the Central European Free Trade Agreement) will cause changes to the Bosnian economy, which heretofore has relied heavily on free trade with Croatia through CEFTA. A significant shock to the Bosnian economy caused by Croatian accession could trigger a political response, making Europeanization a viable alternative to the status quo. In order for the economic impact to be translated into politics, there must be an engaged populace willing to push for reform and translate their desire for Europeanization into a political force. Ultimately, I argue that the lack of effective inter-ethnic civil society and political mobilization in Bosnia will prevent significant political movement towards Europeanization, despite any economic discomforts caused by Croatia's EU accession. My research focuses on the origins of the stagnancy in Bosnian democracy and lack of progress towards EU accession. In this paper, I analyze the possible impact Croatian accession could have in pushing Bosnia towards the EU. I argue two points: first, that problems in Bosnia's EU negotiations are due to a political structure that prioritizes staying in power and fosters corruption, and second, that Croatian accession will not change the status quo. I draw on the external incentives model of Europeanization and propose an additional section whereby politicians will only respond to external incentives if it is necessary to do so to continue holding political power.2 The sources I use for this paper include academic studies of the region's politics, local and international journalism, and the EU's own reports on Bosnian progress towards accession. The rest of my paper is divided into five parts: first, I briefly detail the creation of the current Bosnian political system and its practice. Second, I analyze the political obstacles to Bosnian accession and the success of recent negotiations between Bosnian politicians and the EU enlargement committee in overcoming those obstacles. Third, I examine the economic situation in Bosnia and the impact of Croatian accession to the EU on the Bosnian economy. Fourth, I determine to what extent the effect that Croatian accession has on Bosnia can be translated into politics. To assess the likelihood of any of the previously discussed changes coming to pass, I use a model of external incentives focusing on EU conditionality, derived from what Sedelmeier calls "rational institutionalism".3 In theoretical explanations of Europeanization, rationalist frameworks derived from incentives and conditionality are contrasted with constructivist ones derived from models of social learning and spreading norms.4 In examining the Bosnian case, a few factors stand out that make a rationalist model the more appropriate one to apply. Most prominently, the deep ethnic divisions in Bosnian society are not likely to be overcome through a brief process of socialization in the ten years that Bosnia has been listed as a potential EU candidate. Additionally, for social learning to take hold, citizens must be convinced to identify with the EU.5 That has not happened, with popular support for Europeanization being lukewarm at best. Looking at the impact of Croatian accession through an external incentives model, it increased the cost of non-compliance with EU regulations in that if Bosnia does not comply, Bosnian farmers will not be permitted to sell most of their agricultural products in Croatia, their largest export market. As will be shown, however, Bosnian politicians have not made and are not likely to make any movements towards the EU as a result of Croatian accession. The reasoning for this is that they do not feel any significant political pressure to do so. 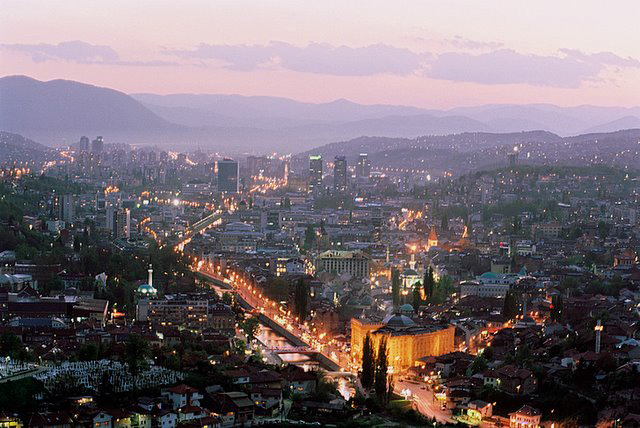 The city of Sarajevo, Bosnia's capital and largest city. Civil society is an essential element of liberal democracy because it provides a method for citizens to have their opinions heard in government. However, in Bosnia the weakness of inter-ethnic civil society has insulated the politicians from their constituents. Bosnian politicians do not respond to incentives based upon the good of the country because there is no widespread internal political pressure forcing them to do so. In order to address this situation within a rationalist framework, I propose a corollary to the external incentives model: leaders will behave rationally and follow external incentives if it is necessary to do so to retain power. This section will examine the creation of the Bosnian political system and provide context for later discussions of ethnic protections within the Bosnian constitution. It is not an exaggeration to say that political problems in Bosnia and Herzegovina can be traced back to the country's founding. The Bosnian constitution was established in Article IV of the General Framework Agreement for Peace in Bosnia and Herzegovina, commonly referred to as the Dayton Accords, which ended the conflict in Bosnia in the mid-1990s. Because of the highly contentious nature of the Dayton peace talks, the Bosnian constitution, in order to get all major ethnic groups—Serbs, Croats, and Bosniaks (Bosnian Muslims)—to sign on, was created as a deeply flawed document, a patchwork of compromises and appeasement. Accordingly, the political system established in Article IV of the Dayton agreement is a reflection of that process. The overriding purpose of the Bosnian constitution is to make sure that each of the "constituent peoples", as the three major ethnic groups are referred to, has tremendous constitutional protection from the other two. Actions can also be blocked for being destructive towards the interest of an entity, which has been invoked numerous times by representatives of the Republika Srpska in order to protect entitylevel powers. The net effect of the protections put in has been to make getting any sort of meaningful reform passed impossible, due to the Sisyphean task of crafting legislation that will appeal to three factions with very different, and occasionally contradictory interests. So deeply is the polarization and division ingrained in the Bosnian legislature and presidency that Bosnia is unable to enact the now six-year old Stabilization and Association Agreement (SAA) that it signed to provide a framework for eventually becoming a candidate for EU accession. So deeply is the polarization and division ingrained in the Bosnian legislature and presidency that Bosnia is unable to enact the now six-year-old Stabilization and Association Agreement (SAA) that it signed to provide a framework for eventually becoming a candidate for EU accession. It is unable to do so because it still has not met the preconditions for the agreement. While not as much attention has been focused on solving Bosnia's economic problems in order to prepare for EU accession, a tanking economy would severely hamper Bosnia's attractiveness as an EU candidate country. However, while Sejdic-Finci implementation and establishment of a coordination mechanism are important topical concerns and certainly are major obstacles to Bosnian accession, to focus on them is to ignore the underlying problems with Bosnia's attempt to join the EU: namely, the fragmentation and subsequent politicization that is endemic in Bosnian politics, and, more seriously, a political timeframe that is not conducive to significant changes. Bosnia has a federal government, two entity-level governments, and ten canton-level governments (cantons being the political divisions in the Federation). This swollen and complex bureaucracy leads to widespread fragmentation of legislation and authority, which causes problems in many sectors including the civil service and budget.14 Issues of fragmentation are difficult to address because of the varied interests of the different ethnic groups—Serbs want to maintain as much power as possible on the entity level because of their control over the RS, Bosniaks want power concentrated on the federal level to limit the RS's power, while Croats want powers devolved to the cantons because they have guaranteed control over half of the cantons. Fragmentation is also difficult to address because of a political timeline that de-incentivizes working towards impactful changes. With a twoor four-year electoral cycle, pushing for a six-year reform plan does very little to ensure re-election. In this section, I look at the struggles of the Bosnian economy and potential pitfalls ahead due to Croatian accession. Compounding To compound the political stagnation harming Bosnia's prospects for EU accession, the Bosnian economy is struggling as well. Bosnia's trade deficit rose 4.4 percent from the first half of 2011 to the first half of 2012,15 caused in part by stalled export growth.16 Unemployment also remained high, at 28 percent. The largest employer in Bosnia continues to be the public sector, which added jobs as private companies in agriculture and manufacturing lost jobs. There are also several signs that the political situation in Bosnia is harming its economic prospects. The delays to the state-level budget, which have occurredbeen happening regularly (every year)17, have begun to affect Bosnia's ability to enact a credible fiscal policy. Privatization of state-owned companies has not proceeded as planned, and weak rule of law and political corruption is destabilizing the business environment. While not as much attention has been focused on solving Bosnia's economic problems in order to prepare for EU accession, a tanking economy would severely hamper Bosnia's attractiveness as an EU candidate country. If politicians continue to ignore Bosnia's economic deficiencies, an already damaging situation could become much worse. Now that Croatia has joined the EU, the Bosnian industries that had exported heavily to Croatia will have to change to conform to newly implemented EU standards for production and labeling. Forty-eight percent of Bosnian exports in 2012 were to Croatia, making this an urgent issue to address.18 Notably, this will affect any product of animal origin, potatoes (which will not be ready for export to the EU until 2016), and industrial products.19 In order to make its products acceptable for EU export, Bosnia will have to coordinate a regulatory body to certify its production methods. However, the issue of food regulation has fallen victim to the fragmentation and politicization mentioned earlier; there are numerous agencies on various levels of government, all with different competencies.20 Developing a unified system of regulation and labeling that the export industry requires will take cooperation among the Federation and the RS that has been rather rare in recent times. On the other hand, if politicians were to delay acting, it could cause serious consequences for a large portion of the Bosnian export industry. The government of the RS, currently led by Milorad Dodik of SNSD, has adopted a hardline position on the distribution of competencies. The government of the RS, currently led by Milorad Dodik of SNSD, has adopted a hardline position on the distribution of competencies, refusing to yield any additional powers to the state-level governments and insisting that the RS should be allowed to exist as its own state.22 Given these parameters, it is not hard to forecast a scenario where the very intransigence Dodik and his party promote causes harm to the RS's economy, leading to political upheaval in the RS. This view is simplistic, as will be explored later, but not without use for showing how the current policies of Dodik and SNSD are unsustainable for a Bosnian state looking to join the EU. Another potential consequence of Croatian accession has to do with increased migration and the upcoming census planned for October 2013. The census, which is to be the first in Bosnia since 1991, could potentially have significant consequences for the distribution of political power in Bosnia. If the census shows that people identifying as "other" (i.e. not Serb, Bosniak, or Croat) outnumber those who identify as Croatian, it will cast doubt on the whole system of constitutionally protected peoples and "national minorities". Making this prospect more likely is the increased appeal of emigration to Croatia for Bosnian Croats, who can freely immigrate to Croatia, where they would likely receive higher salaries and better health care.23 A re-evaluation of the constitutional protection afforded Croatians in government could dovetail nicely with SejdicFinci implementation, but, again, would require agreement on the behalf of parties that have a vested interest in refraining from any sort of deal. This article examines the impact of Croatian accession to the European Union on Bosnian politics, concluding that, despite the negative economic effects Croatian accession will have, no significant positive change in Bosnia's own EU negotiations will result. This is placed in the framework of a rationalist external incentives approach to Europeanization, which is expanded to include a requirement of sufficient domestic political pressure to ensure elites follow incentives and to prevent rent seeking. I find that the major cause preventing domestic political pressure on elites is lack of political mobilization. Using studies of civil society in ethnically divided countries, I conclude that Bosnia's lack of civic political activity relative to other post-communist countries can be attributed to an absence of intra-ethnic civil society organization, and that the anti-government protests started in February were doomed to fail because they did not unite Bosnian citizens across ethnic divisions. Berman, Sheri. 1997. “Civil Society and the Collapse of the Weimar Republic.” World Politics 49: 401–29. doi:10.1353/wp.1997.0008. Brussels, Belgium: CEFTA Secretariat, 2012. s.v. “CEFTA Trade Statistics Half Year Update.” http://192.232.255.119/~cefta/sites/default/files/Cefta_trade_1h2012.pdf (accessed July 17, 2013). “b92.net.” Accessed July 17, 2013. http://www.b92.net/eng/news/region.php?’y=2012&mm=08&dd=16&nav_id=81798. The Economist, “economist.com.” Accessed July 17, 2013. http://www.economist.com/news/europe/21573595-politicians-need-work-together-if-bosnia-join-european-union-balkan-dysfunction. EU Delegation to Bosnia and Herzegovina, “Europa.ba.” Accessed July 17, 2013. http://www.delbih.ec.europa.eu/Default.aspx?id=74&lang=EN. European Union, “European Union.” Accessed July 17, 2013. http://ec.europa.eu/agriculture/enlargement/countries/bosnia-herzegovina/profile_en.pdf. European Union, “European Union.” Accessed July 17, 2013. http://ec.europa.eu/enlargement/pdf/key_documents/2012/package/ba_rapport_2010_en.pdf. European Union, “European Union.” Accessed July 17, 2013. http://ec.europa.eu/enlargement/pdf/key_documents/2012/package/ba_rapport_2011_en.pdf. European Union, “European Union.” Accessed July 17, 2013. http://ec.europa.eu/enlargement/pdf/key_documents/2012/package/ba_rapport_2012_en.pdf. Hayden R (2005) ‘Democracy’ without a demos? The Bosnian constitutional experiment and the intentional construction of nonfunctioning states. East European Politics and Societies 19(2): 226–59. Howard, Marc Morj. 2003. Civil Society and Democratization. The Weakness of Civil Society in Post-Communist Europe. doi:10.1086/420676. Jukic, Elvira. balkaninsight.com, “Fule Advises Bosnia to Emulate EU-Member Croatia.” Accessed July 17, 2013. http://www.balkaninsight.com/en/article/fule-calls-for-progress-in-bosnia. Kelley, Judith. 2004. “International Actors on the Domestic Scene: Membership Conditionality and Socialization by International Institutions.” International Organization 58 (03): 425–57. doi:10.1017/S0020818304583017. Kubicek, Paul. 2003. The European Union and Democratization. Europe and the Nation State. Mujanic, A. (2014, February 18). 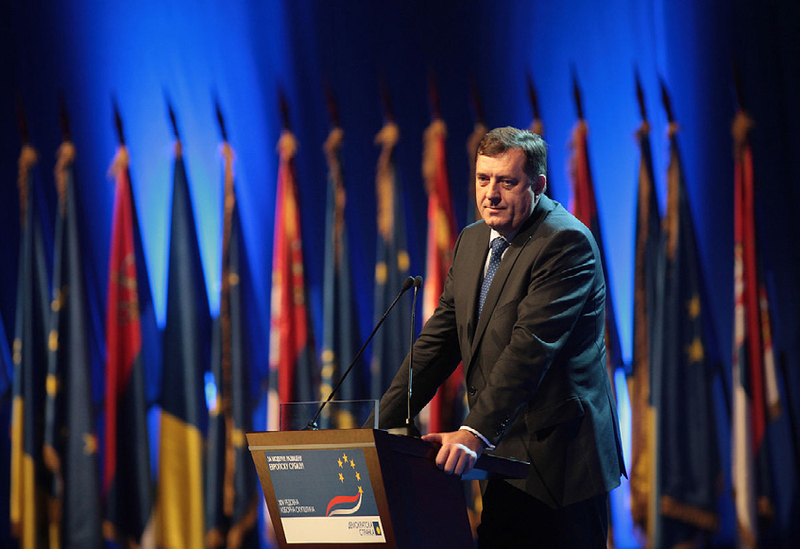 Who’s Afraid of Milorad Dodik? Retrieved March 10, 2013. O’Dwyer, Conor. 2012. “Does the EU Help or Hinder Gay-Rights Movements in Post-Communist Europe? The Case of Poland.” East European Politics. doi:10.1080/21599165.2012.721094. O’Loughlin, J. 2010. “Inter-Ethnic Friendships in Post-War Bosnia-Herzegovina: Sociodemographic and Place Influences.” Ethnicities 10 (1): 26–53. doi:10.1177/1468796809354153. Rajčević, Srđan. “Balkaninside.com.” Accessed July 17, 2013. http://www.balkaninside.com/croatia-is-accessing-the-eu-on-july-2013-what-does-that-mean-for-the-rest-of-us/. Sadik Ahmetović: Bojim se da je cilj protesta podjela Federacije BiH. (2014, February 9). Retrieved March 10, 2014. Schimmelfennig, Frank, and Ulrich Sedelmeier. “Governance by conditionality: EU rule transfer to the candidate countries of Central and Eastern Europe.” Journal of European Public Policy. no. 4 (2004): 661-79. Varshney, Ashutosh. 2001. “Ethnic Conflict and Civil Society: India and Beyond.” World Politics. doi:10.1353/wp.2001.0012. Kelley; Kubicek; Schimmelfennig and Sedelmeier. Office of the High Representative. EU Delegation to Bosnia and Herzegovina. “Sarajevo Twilight” by BloodSaric-Own Work. Licensed under the Creative Commons Attribution-Share Alike 3.0 Unported via Wikimedia Commons. “Milorad Dodik” by Demokratska Stranka DS-uploaded by BokicaK. Licensed under the Creative Commons Attribution 2.0 Generic via Wikimedia Commons.